Cook rice and broccoli as directed on box. In medium bowl, mix rice and broccoli, the cheese, almonds, chopped cilantro, 1/2 teaspoon of the chili powder, 1/4 teaspoon of the oregano and 1/4 teaspoon of the salt. In pie plate or shallow bowl, beat eggs, remaining chili powder, oregano and remaining salt if desired with fork until well blended. In 10-inch nonstick skillet, heat 1 tablespoon of the oil over medium heat. Dip 1 tortilla into egg mixture, letting egg mixture soak into tortilla; place in hot skillet. Cook until bottom of tortilla is browned, spooning 2 tablespoons egg mixture over tortilla (some egg mixture may run off). Turn tortilla; place about 1/2 cup rice mixture down center of tortilla. Fold sides of tortilla over rice mixture; press with pancake turner. Turn filled tortilla and press again. 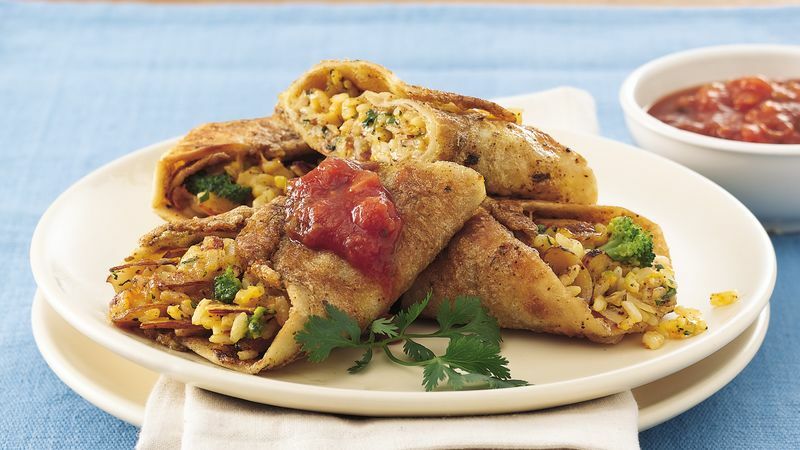 Cook 1 to 2 minutes longer or until tortilla is browned and filling is thoroughly heated. Place filled tortilla on plate; cover to keep warm. Repeat making 3 more filled tortillas. Cut each filled tortilla diagonally in half. Garnish with cilantro sprigs; serve with cucumbers and salsa or if desired, serve with green salad.